The wedding day started on Kastellholmen in Stockholm, beside the restaurant Kolskjulet. The wedding couple Lotta and Peter had four bridesmaids and four grooms. In the background on the other side of the water is the tivoli Gröna Lund. 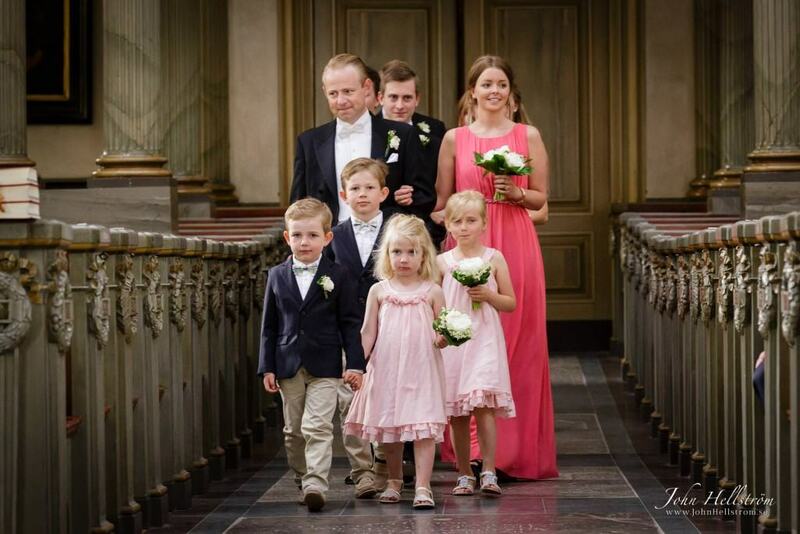 Peter and Lotta got married in church Hedvig Eleonora. It is the largest domed church and the second largest church we have regardless of style. It holds 700 people and opened in 1737. It is located in central Stockholm, but the trees is hiding it somewhat when looking from ground level. The church was named after king Karl X Gustavs wife, queen Hedvig Eleonora. The wedding couple went from the church to the restaurant in a classic Rolls Royce. The restaurant Kolskjulet was built 1852 as a coal hopper fleet steamers. The building was designed like so many other buildings on Skeppsholmen and Kastellholmen fleet own architect Fredrik Blom. It may be 20 to 110 people inside Kolskjulet. Toastmaster was Maria who is the groom's sister. The DJ was DJ Rolle. It was a very nice party! John Hellstrom is a wedding and portrait photographer from Stockholm, Sweden. He does assignments world wide.